The 2001 Toys for Tots campaign officially kicked off on Nov. 14 with a formal ceremony in front of the Camp Foster Base Exchange. The ceremony hosted visits from Lt. Gen. Wallace C. Gregson and the III MEF Band, along with a special guest appearance by Santa Claus. The campaign began with a performance from the III MEF Band, who played various patriotic tunes and holiday music for shoppers entering and exiting the BX. Various other Toys for Tots campaigns are taking place in November and December, including sporting events Nov. 23-25 at MCAS Futenma, “Bring a Toy to Church Sunday” at base chapels on Nov. 25 and a III MEF Band concert at Butler Theater on Dec. 1. 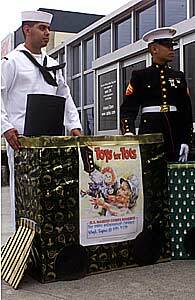 Admission to all Toys for Tots events is a new, non-violent toy. The Toys for Tots campaign began in 1947 with the goal of delivering a message of hope to children throughout the world so that they might in turn grow into responsible, productive, patriotic citizens and community leaders. To volunteer, make a donation or for more information on the Toys for Tots program, contact Cpl. Crystal Foxworth at 645-5719, or email her at foxworthce@iiimef.usmc.mil.